Since 2007, the ErgVideo system of training with the CompuTrainer has been a staple of interactive indoor cycling training. The latest advance has been partnering with Peaks Coaching Group to develop the Hunter Allen Power Training ErgVideo series. We take the system for a virtual spin. For those of us living in northern climes, we have a couple of options for off-season training. We can bundle up and brave whatever elements nature throws at us, but this is often more for flahute points and coffee shop bragging than for getting in actual training. We can abandon the bike and do whatever activities we can to keep our fitness and sanity until the roads clear up. Or we can jump on the indoor trainer. For some, the third option isn’t really an option at all because they feel that indoor cycling is just far too boring. However, I’ve always valued the ability of indoor training to give me a highly focused and specific workout without worrying about finding the perfect stretch of road free of traffic, stops, or sometimes corners. For example, even here in the quiet farm roads of the Niagara region, where we have lots of flat roads, the longest uninterrupted stretch of road lasts me about 15 min at time trial pace, well short of the typically recommended 20 min field test. Coupled with the variable winds and the plainly brutal winters, I much prefer to do my 20 min threshold tests throughout the year in the controlled indoor environment. 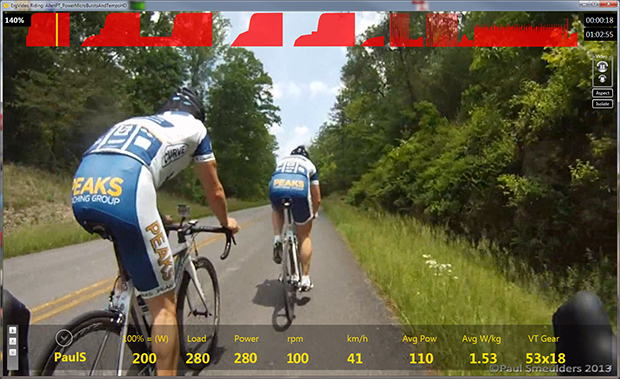 You can easily preview and customize rides with ErgVideo, seeing everything from the profile to the power metrics. •	The point-of-view helmet cam embedded in the ride really gives you a sense of being in the pack. •	You are not relying on your own motivation for intervals, often inevitably lacking when riding indoors. Rather, you’re thrust into the middle of a group ride or race and the motivation is built in. •	You can ride the same workout with other riders, and each of you will get the same workout tailored to your individual fitness. •	The software is incredibly easy to use and customizable in both workout design and intensity of effort. Simply adjusting your FTP will completely alter the intensity and training stimulus of a video. ErgVideo just makes indoor training so much closer to the enjoyment of a real ride than any indoor workout I can do on my own. 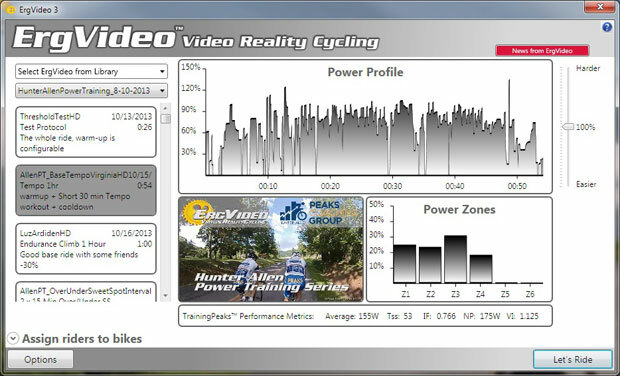 The latest addition to ErgVideo is the partnership with power-training guru Hunter Allen and Peaks Coaching Group to design specific video workouts and also a specific ErgVideo-based training plan. Intended to be the backbone of your off-season indoor training, the Hunter Allen Power Training (HAPT) plan is primarily designed to maximize your functional threshold power, the critical foundation of success in most cycling disciplines and multisport. I sat down with Hunter to talk through the design and specifics of HAPT. Pez: There are lots of winter training plans out there. What’s the HAPT philosophy to winter training? HA: So many of these winter training programs and indoor training centers just kill people all winter long because they feel like if the riders don’t get in a super hard workout, they won’t come back to another class. This completely goes against much of the purpose of having an “off-season.” I have seen hundreds of riders become “January Stars” because of this and when the actual spring racing season starts, they are burned out and riding slower than the previous October. Now, don’t get me wrong, you can train hard in the off-season, but you have to dose the intensity in a rational, progressive, timely manner with an overall plan in mind. That way you improve your FTP, and prevent from peaking in January. We set out to create a set of workouts that are what you should be doing in the off-season, building a foundation of fitness with tempo, sweet-spot, and occasional lactate threshold work. Many cyclists also do some sort of weight training in the winter, but never have a plan to transition that new found “machine strength” into effective cycling strength, as you have to be able to translate that strength into a circular pattern with the legs. One of the best ways I have found over the years is by doing “Big Gear Intervals” or our more common name: Tractor Pulls! We have one video in which teaches you and helps you with this translation of new-found force production and that will make a huge difference for the upcoming season. With the “micro-burst” video, you even get a little bit of neuromuscular power work in there. The initial massive power surges followed by sustained sweet spot riding (Explosive Power Sweet Spot video) closely simulates the efforts required to make and stick a breakaway. My buddy Rob and I found this the ugliest video, as the surges put you deep into the red that you fight throughout the sweet spot to recover from. Pez: How do you mix and match HAPT over the course of the winter to periodize and build your fitness? HA: Since each video has a purpose physiologically, and there is such a great library of ErgVideos out now, we were able to plan the training just like we would a normal training plan of an athlete that wants to improve over the winter, but again, not peak in January. The first part of this is to build a foundation of fitness, through solid tempo work, which includes some changes in cadence and force. I really hate using the word “Base Training” because it conjures up long, steady distance rides that are well, a bit boring. And for those of us that aren’t professional cyclists, we just don’t have time to do them! It’s better to build what I call your “Power Foundation”, which is doing a little higher intensity work in your tempo, and sweet-spot levels, and getting it done in less than an hour and half. The second part of this periodization plan is to translate that weight training work off the bike to effective force on the bike and then third, we start to prepare you for the season by making sure you are ready for the quick rhythm changes in a peloton or group ride. Pez: Should the HAPT system be adapted for different types of cycling disciplines, like mountain biking, crits, or time trials? HA: This plan focuses on the foundation of all cycling that is at the heart of off-season or general cycling training, and that is to drive your functional threshold up as high as possible. That should be everyone’s goal before focusing specifically on the demands of a particular discipline like mountain biking or criterium riding. The principles are the same for all riders, no matter the discipline, it’s only really in the early season that I believe riders should highly specialize their workouts for their unique event. So yes, this plan can be used by any cyclist or triathlete. This Tempo Grind video features sweet spot efforts done at three progressively higher cadences (<70, 85, >95 rpm). It's great for keeping both high cadence and power despite fatigue, as one or the other usually drops. Pez: How do you identify your training priorities and possibly use HAPT differently or customize its use depending on your strengths or weaknesses? HA: That’s the beauty of the ErgVideo system. They have a huge library of specific workout videos covering almost every type of workouts, from sprints through anaerobic capacity efforts through to long hill intervals and even motorpacing. In addition, there are lots of race videos covering criteriums, circuit races, through to time trials and even team time trials. And their software makes it really easy to customize your own ride. 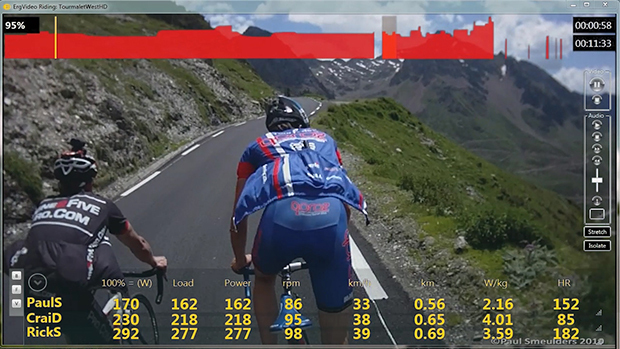 So for example, you can take the team time trial video, which features a 1:3 work to recovery ratio, and adjust it to a killer anaerobic effort and high-effort recovery ride by riding it with your normal FTP. Or you can ramp the FTP down a bit and turn it into a great “over-under” type of workout, with the “on” efforts at or slightly below your real FTP. Or you can easily play DJ and loop one particular effort over and over, for example you can loop one particular hill and extend or shorten the recovery time, and even make the recovery portion a different FTP than the actual hill to independently manipulate the intensity and duration of the efforts and recovery. The software makes it so easy to design your own highly-specific workout that the possibilities are almost endless. The point of view camera work and the HD video quality provides a really immersive riding experience. So the first lesson to take away from the HAPT philosophy is that off-season training is NOT simply about thrashing yourself silly each and every ride. That’s where most of us default towards, because we feel we need to trade reduced volume with higher intensity. The second aspect of off-season training is to gradually and steadily build overall cycling fitness, without worrying too much about the specific demands of a cycling discipline. That overall increase in your functional threshold is the basis of all cycling, and that should be the focus of the off-season before diving into a specific discipline. That’s completely in line with the overall science of periodization throughout the season. The final lesson is to get off the bike over the off-season and keep fit in other ways in addition to just bike time. Not only will the variety keep you mentally sane, the overall improvements in whole-body fitness will simply make you a better overall athlete. 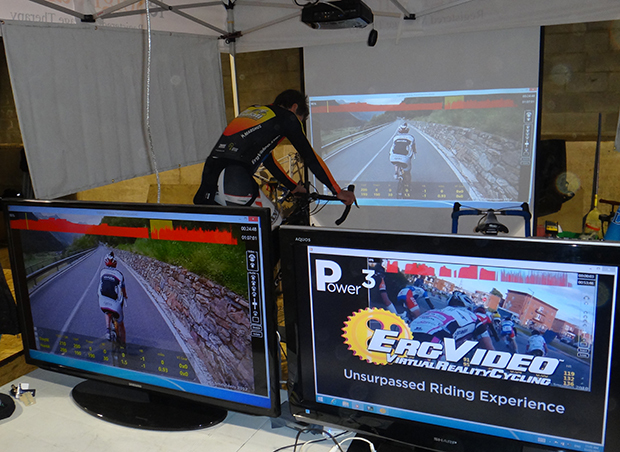 The ErgVideo system is optimized to work with the CompuTrainer. You can replicate some of the workouts on your own using another trainer and especially if you have a power monitor. 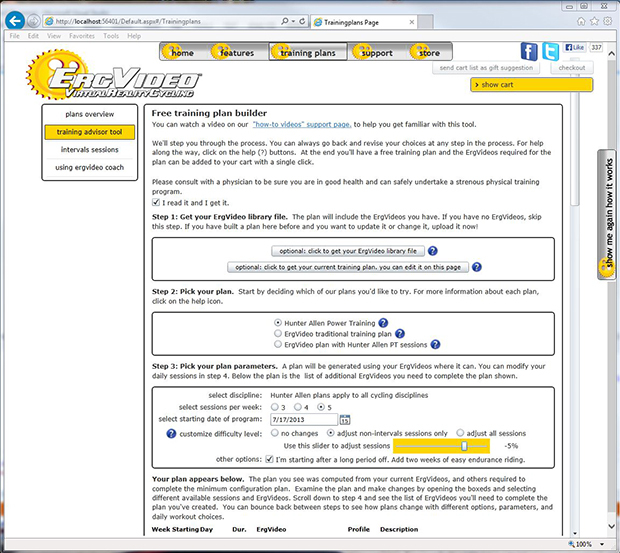 The ErgVideo software runs on PC computers, and pretty much any relatively recent laptop or desktop running Windows XP, Vista, 7 or 8 should work. Minimum specs are 2GB RAM, 1 GB video, and enough hard drive space for however many videos you own (typically ~4 GB per video). 1. The Hunter Allen Power Plan, featuring the 6 Hunter Allen videos + 4 others (i.e., 10 are required to run the full training plan). 2. Training plan designed by Paul Smeulders, ErgVideo founder and NCCP Level 3 cycling coach. These use a wide range of existing ErgVideos. 3. Training plan designed by Paul Smeulders incorporating the 6 Hunter Allen Power Training videos plus a selection of others. The chance to have a customizable and free training plan by power training guru Hunter Allen is a great bonus. Other customizable features include: whether you want 3, 4, or 5 workouts a week; the starting date; whether you want a 2-week block of base endurance workouts before jumping into the program; and whether you want easier adjustments to your endurance or interval workouts. Once set, these are built into your ErgVideo 3 software. So all you have to do is click on the workout scheduled for that date, calibrate your CompuTrainer, and ride! I have been on the Hunter Allen training plan with the 10 videos since early December, and have to say that I’m quite enjoying them so far. The bulk of the videos are all based on driving up your functional threshold power with lots of variations of “sweet spot” and threshold efforts, but there’s lots of variety amongst the videos and within the free plan, so it doesn’t get repetitive or boring. From initial assessment of the philosophy and purpose, the program makes a lot of sense and appears to be a great addition to the ErgVideo lineup. Crank up your FTP and overall aerobic fitness this off-season and make 2014 your strongest year yet regardless of what cycling you’re aiming for. Check out the entire range of videos at ErgVideo and Peaks Coaching Group for more information on their coaching services.